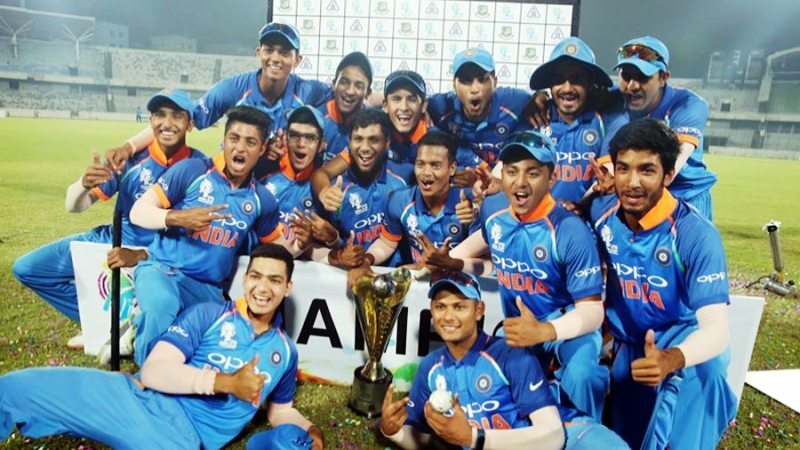 Probashbangla24 online Desk : India’s U-19 team Sunday followed the footsteps of their seniors to win the U-19 Asia Cup title with a crushing 144-run win against Sri Lanka in the final with Delhi boys Ayush Badoni and Harsh Tyagi playing prominent roles. Just a week back, the senior team beat Bangladesh in a closely fought final in Dubai to emerge as continental champions. Runaway favourites, India outplayed Sri Lanka in all departments by first scoring an imposing 303 for six at the Sher-e-Bangla Stadium after skipper Prabh Simran Singh won the toss and elected to bat. All the Indian batsmen contributed with openers Yashasvi Jaiswal (85 off 113 balls) and Anuj Rawat (57 off 79 balls) creating solid foundation with 121-run stand. However the highlight of the Indian innings was Badoni’s blistering unbeaten knock of 52 off 28 balls which included five sixes and two fours. Along with skipper Prabh Simran (65 no off 37 balls), Badoni added 110 runs in 9.1 overs to literally bat Sri Lanka out of the match. The island nation were never in the chase as they were all out for 160 in 38.4 overs losing wickets at regular intervals with left-arm spinner Harsh Tyagi’s registering brilliant figures of 6 for 38 in 10 overs. He flighted a few and fired a few down the channel in what was his best performance at the U-19 level till date. India did have one tough match against Bangladesh in the semi-final which they won by two runs. “I couldn’t play today but I am very happy that my team won,” India’s regular captain Pavan Shah said in company of his deputy and stand-in skipper Prabh Simran. Man of the match Tyagi, who bowled a disciplined line said: “The instruction was to bowl at one spot after doing a video analysis of the Sri Lanka team. The wicket also assisted the spinners.” It was left-hander Jaiswal, who hit some flowing drives including a pulled six over deep mid-wicket off left-arm spinner Dushith Wellalage. For his consistency (318 runs in the tournament), Jaiswal was adjudged man-of-the-tournament. The Lankans used five spinners — three off-breaks and two left-arm spinners but all of them were slow through the air giving batsmen enough time to go on the back-foot. Indian batting’s most entertaining part was the death overs when Badoni and Prabh Simran brutally assaulted the opposition spinners. In an over from left-arm spinner Shashika Dulshan, Badoni hit four sixes with a couple of them landing in stands. A product of Delhi’s famous Sonnet Club, his technique against spinners was impressive and like his ‘senior’ Rishabh Pant, he loves the slog hit over cow corner. Brief Scores: India U-19 303/6 (Yashasvi Jaiswal 85 off 113 balls, Anuj Rawat 57 off 79 balls, Prabh Simran 65 no off 37 balls, Ayush Badoni 52 no off 28 balls) Sri Lanka U-19 160 in 38.4 overs (Harsh Tyagi 6/38 in 10 overs). India U-19 won by 144 runs.